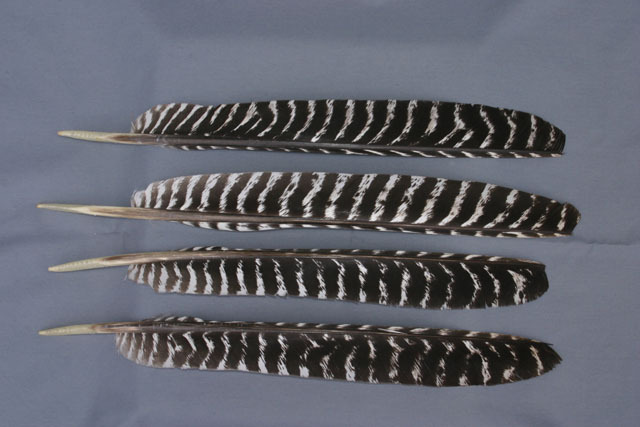 This product is widely used for Native American bustles when a high quality primary feather with very little if any wear is visible on the tip of the feather. 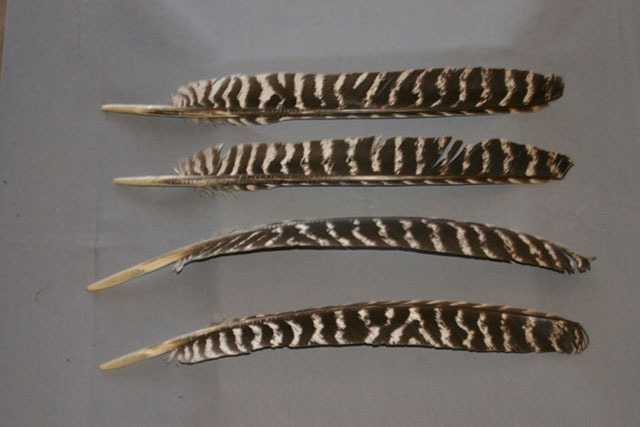 Wild turkey primaries are an excellent choice for making natural feather quill pens for calligraphy. They will range in length from 14-16 inches from tip to quill end. You will find this item very useful for bustles too but it's more likely use is for old-fashioned fishing floats and fletches for arrows. 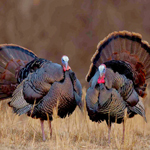 You will notice the main difference with grade #2 compared to grade #1 is the blunted ends of the primaries caused by the adult tom turkey dragging his wings during the spring mating season. Grade #1 primaries are what is needed if producing a high grade arrow or fletching for resale is desired or to simply produce high quality arrows for yourself. 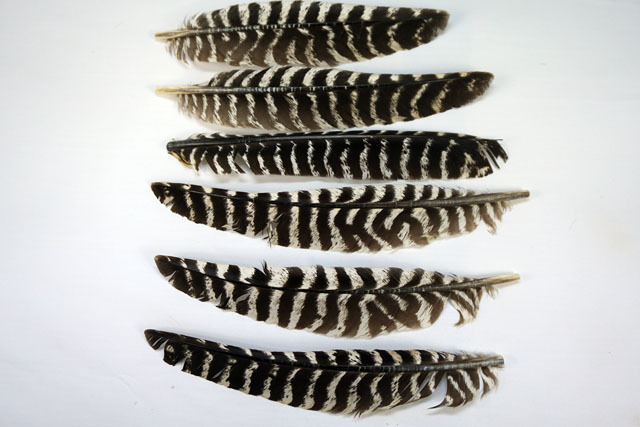 They will have near perfect webbing throughout the entire length of the feather. 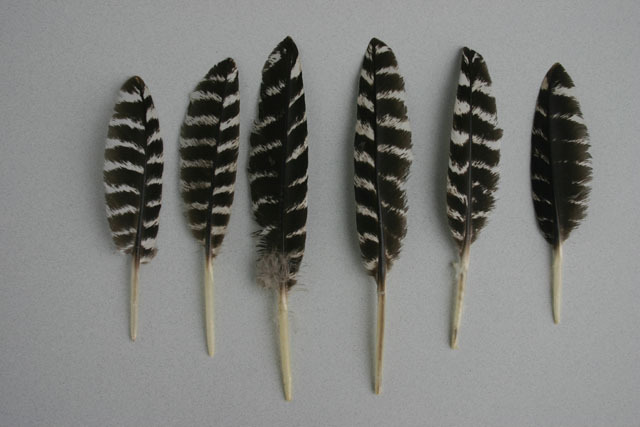 They will rank in the top 10-15% for quality of all the feathers that we sell for fletching. Our #2 grade primaries are a mid grade feather that will yield a high quality fletch as well but will be feathers that tend be a bit shorter in length or that may have a slight flaw. 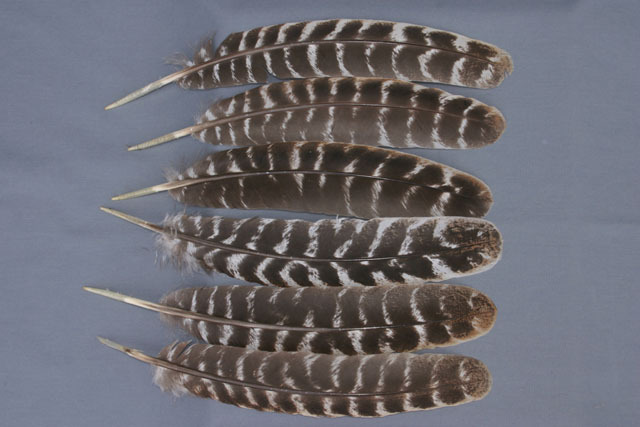 The beauty of these feathers is they are more economically priced. 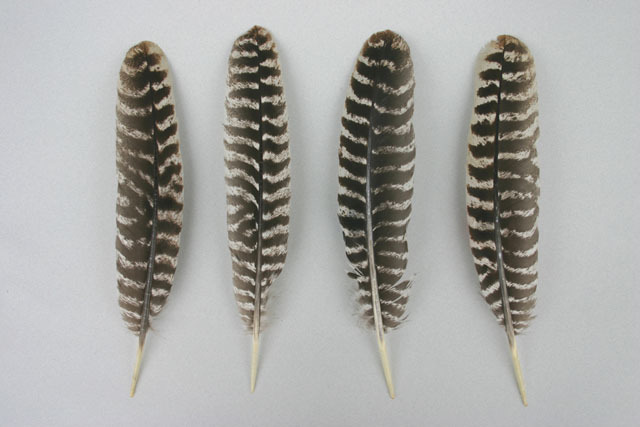 our #3 grade (formerly Grade #2) primaries are a combination of primary feathers that are a bit softer and wider from the inside of the primary wing, solid primary feathers that are moderately flawed, or wrinkled and/or soiled but otherwise intact and the first short feather on the primary wing. These still will be highly suitable for stump shooting arrows, kid's arrows, flu flus, or a reproduction Native American Indian arrow where a rustic look is desired. 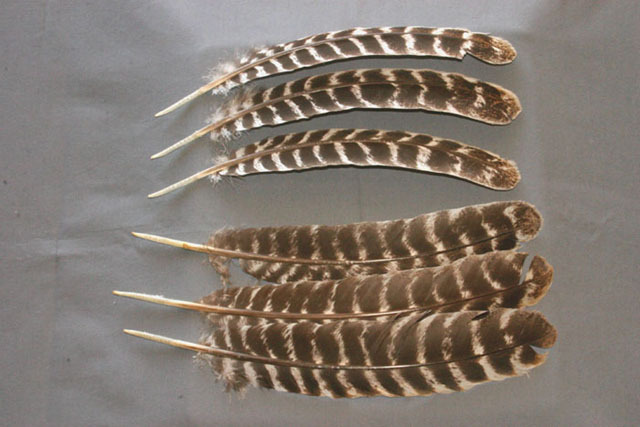 Secondary wing feathers a.k.a barred rounds will range in their overall length from 13 to 15 inches. The longest and nicest shaped feathers will be #1 grade. 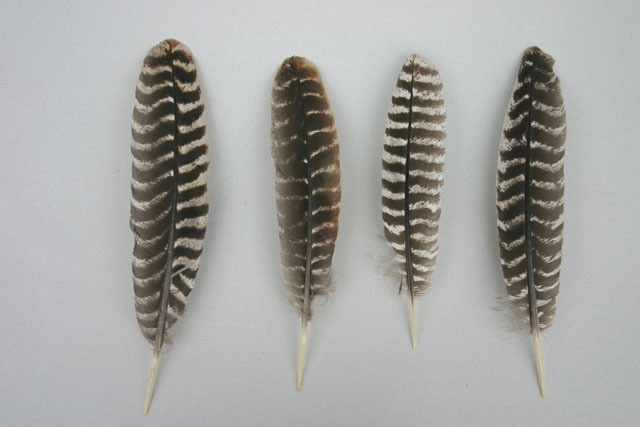 Secondary feathers that are smaller and/or the feathers that are longer but flawed slightly will be what is commonly found in the #2 grade. 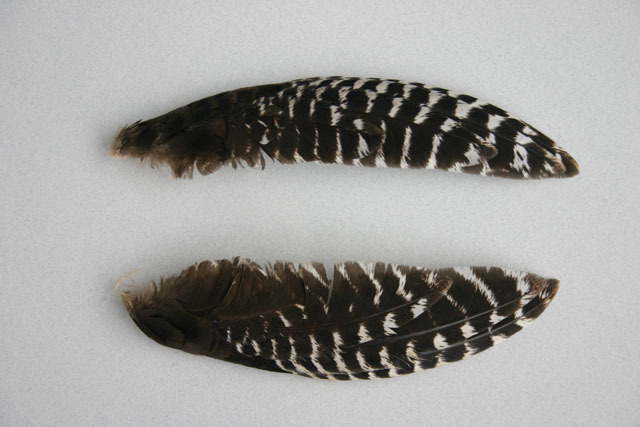 Hen/Jake Secondary Wing Feathers are the smaller version of the secondary wing feathers from adult tom turkeys. They will range in their overall length from 9-13" inches. 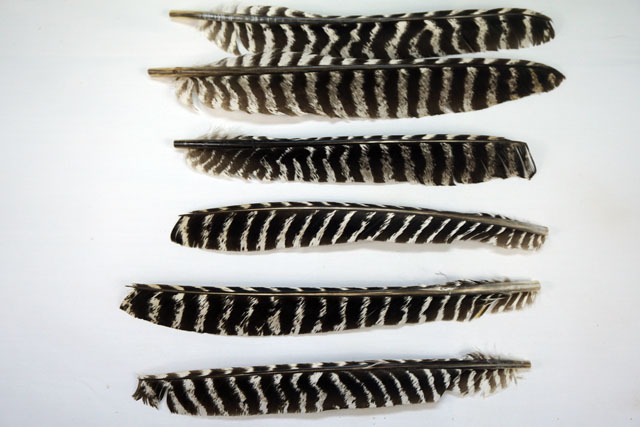 Miniature wings are a tuft of about 4 feathers that will remind you of a turkey wing by it's shape. They are located at the leading edge of the primary portion of the wing. They are approximately 6 inches in length. 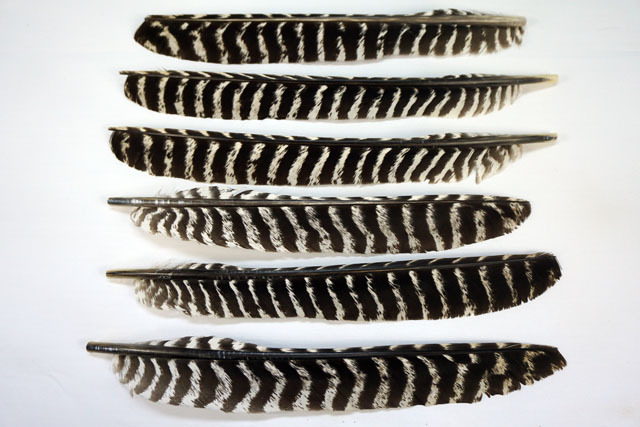 Minature barred Leaves are the high contrast black and white feather that resemble the size and shape of a leaf. They are found on the primary portion of the wing. Barred leaves range in length from approximately 4 inches to as long as 6 inches.